Happy Commencement weekend to the class on 2018! (And for those of us who live there, perhaps a good weekend to see a show that's not in Northampton). There are some good ones in Ashfield, Springfield, Montague... get out of town! There is no doubt that making a commitment to assist artists at risk is tough. It is challenging enough to read about the plight of persecuted populations in the papers or watch news of oppression on television. The narratives and images yank at our hearts, cause our stomachs and throats to knot up. Sometimes the images haunt us for days. Eventually, though, we change the channel, toss the paper out, and get on with our lives. But when working closely with people in danger, people whose lives are affected by violence and tyranny to the extent that they can no longer live, work, create, or love freely and safely, it’s a whole different matter. Linnea and her daughter Heather must navigate a notable shift in their relationship when the progression of Linnea’s Alzheimer’s prompts Heather to take on a maternal role. 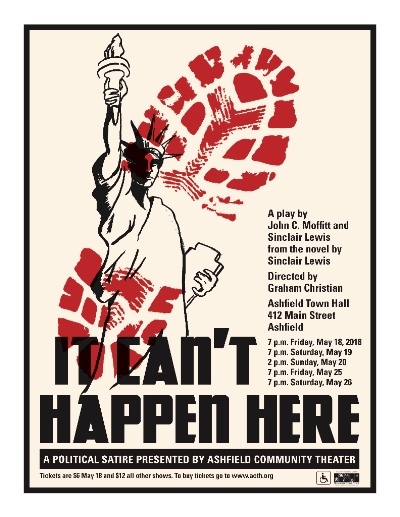 Ashfield Community Theater is extremely happy to announce the opening of our political satire, "It Can't Happen Here," which runs two weekends beginning Friday, May 18. The play is about the election of a fascist American president, Buzz Windrip, his ensuing crushing of civil rights, and the underground rising against him by a Vermont editor, Doremus Jessup, and his family and friends. 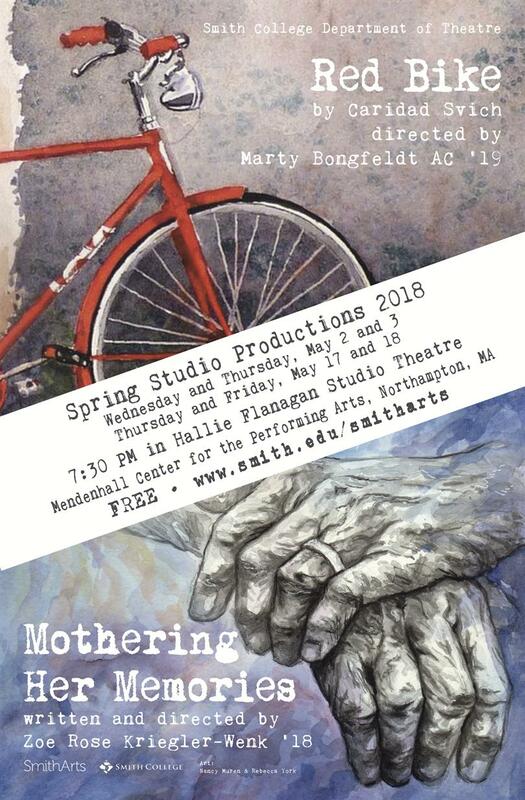 Shows are at at Ashfield Town Hall, 412 Main St., at 7 p.m. on Friday, May 18, Saturday, May 19, Friday, May 25 and Saturday, May 26. An afternoon show also happens at 2 p.m. on Sunday, May 20. Tickets are $6 opening night and $12 all other shows. Reserve them at acth.org or buy them with cash/check at the door. 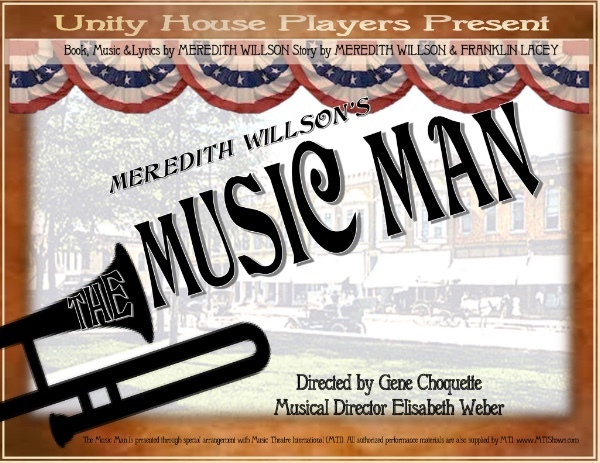 By turns wicked, funny, warm, romantic and touching, The Music Man is family entertainment at its best. Meredith Willson's six-time, Tony Award-winning musical comedy has been entertaining audiences since 1957 and is a family-friendly story to be shared with every generation. Join us for this classic piece of Americana directed by Gene Choquette with Musical Director, Elisabeth Weber! 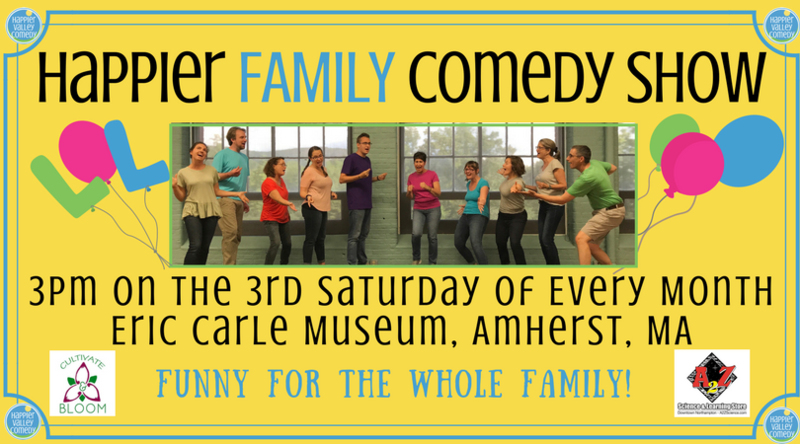 A high-energy, interactive comedy show for the whole family! Come shout out suggestions, or even join us onstage, and we'll create the entire show on the spot. The third Saturday of every month at 3pm at the Eric Carle Museum of Picture Book Art in Amherst, MA. (Audience members are not required to pay museum admission to see the show. 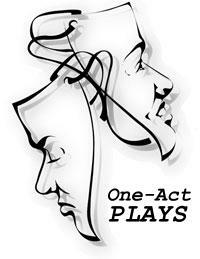 Join us for an evening of one-acts spotlighting local artists! (until 2 hrs before show) $18 Student, $22 General and At Door ($3 more, cash or check). John, a master guitarist who played lead in Van Morrison's band at the age of 17, wrote songs for James Taylor, unknowingly drew praise from Jimi Hendrix, and whom Ed Ward of National Public Radio called "One of the great guitarists of our time," uses a unique blend of storytelling, unearthly sounds, and wicked, layered guitar licks, to send us zipping through the folds of time and space, emerging into the light of a simple, transformative melody. 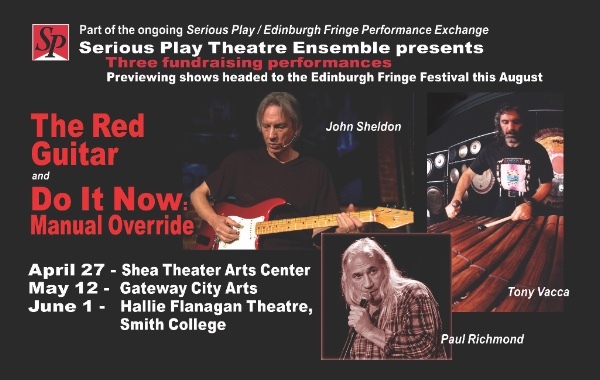 John's ironclad belief in the power of sound pervades the whole performance, the conviction that music is not just entertainment, but a soul saving enterprise, worthy of the lifelong commitment he has made to it. His technical skill never overwhelms the story, the poignant, the humorous, the moments of connection, of illumination. The journey continues, setting a course to the center of who we truly are: vibration. Danger!! Danger!! Systems are being corrupted or broken. A crash surely lies ahead. No time to waste. We must take back control! Do It Now. Manual Override. Pulling the controls together are John Sheldon on electric guitar, Tony Vacca on all things percussion, and Paul Richmond’s beguiling William S. Burroughs-like spoken word. The trio takes on anything from the mundane envy for a neighbor’s dog to nuclear power posturing to interracial tension, turning them into poetic flashes of text that erupt from a hotbed of music. Non-verbal communications on stage, based in trust and intuition between masters at their craft, creates theatrical moments with authentic music interwoven with Richmond’s text. An evening of food for the mind as well as the soul. Through the program, SDCF Observers may have access to the entire rehearsal process, from first rehearsal through opening night. Observers also will have the invaluable opportunity to observe first-hand the techniques, disciplines, approaches, and insights of master artists as they create new productions and revive classics. Each observer receives a weekly stipend of at least $250 as well as a project travel stipend. Anyone with serious interest in pursuing a career in directing and/or choreography may apply to the Observership program. A $25 application fee is required to apply for those unaffiliated with SDC. Any observer who is not already a member of SDC will be awarded a free, one-year SDC associate membership. See the Stage Directors and Choreographers Foundation website for complete program guidelines and application instructions. 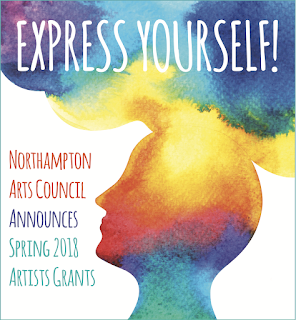 The Northampton Arts Council's ArtsEZ 2018 Grant Round has a deadline of May 18, 2018 Individuals as well as schools and arts organizations are encouraged to seek funding for creative projects to be held in Northampton, Florence, and Leeds. The grants are funded by the proceeds from the Arts Council’s signature events: The Silver Chord Bowl, Transperformance, and First Night. The Arts Council will award up to $20,000 in grants to local artists and arts groups. Grants will be awarded in the following categories: dance, film/video, literature, mixed media, music, schools, theater, and visual arts. Individual artists and arts organizations will receive equal consideration for grants. Last spring, the Council awarded $18,000 to 34 recipients with grants ranging from $250-$1,000. To apply, please complete the ArtsEZ Spring 2018 Online-Only Application Form. It is a simple form with short questions, a place to upload supporting materials and a required project budget. Only one grant application per person or organization will be considered. Please carefully review the Arts EZ Spring 2018 guidelines for criteria and eligibility requirements. Guidelines are available on our website. Projects must start no earlier than July 1, 2018, and must be completed by June 30, 2019. This local round of funding would not have been possible without the support of numerous local businesses, arts organizations, and artists that have helped make our fundraising efforts such a huge success. To read our guidelines, or download a practice application, visit our website. Valley Light Opera announces auditions May 24, 25 and 28th for its 44th annual Fall production, Gilbert and Sullivan's The Gondoliers to be presented in the Fall of 2018 at the historic Academy of Music in Northampton, Massachusetts November 2nd, 3rd, 9th and 10th at 7:30 PM and 4th and 11th at 2:00PM. All roles are open. Set in Venice and Spain, this lively and colorful work includes some of Sullivan's most beautiful and soaring tunes along with extravagant singing and dance ensemble numbers. True to form, the operetta is also full of Gilbert's most biting satire and hilarious wit. No one is safe and the society and government targets are still relevant to modern day. The Gondoliers is the most popular and often-performed of the Gilbert and Sullivan comic operettas after the "Big Three ." Unique among the Gilbert and Sullivan comic operettas, The Gondoliers includes roles for no fewer than 9 principals, along with many opportunities for named characters with speaking roles and featured solos in the ensemble. 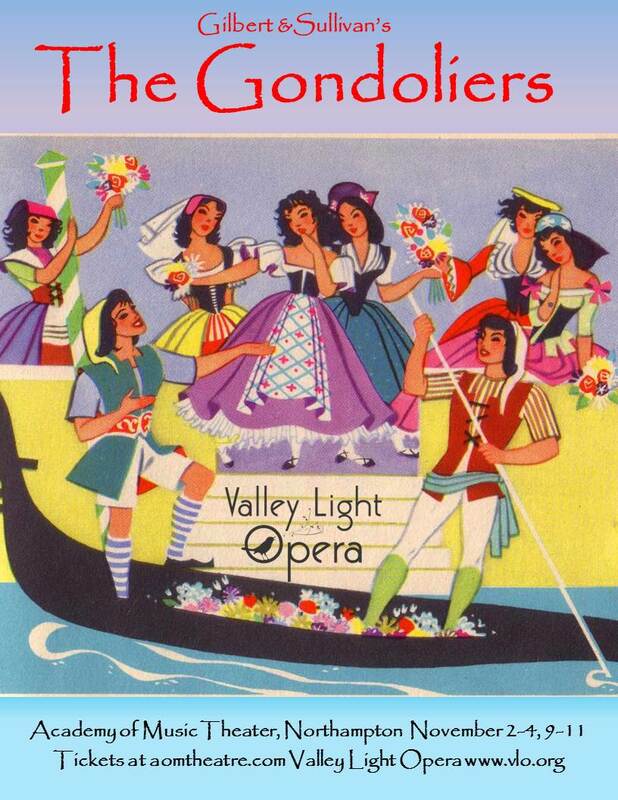 As usual, Valley Light Opera's The Gondoliers will be performed as a full, elaborately staged production, complete with a large orchestra and ensemble, splendid sets and the sumptuous costuming for which the company is renowned. AUDITION SIGNUP IS REQUIRED!! Please sign up for a slot here. Walk-ins may be accommodated if there is time, but audition slots usually fill up fast. Wesley United Methodist Church, 98 North Maple Street, Hadley, MAon Friday May 25th from 7-9:30PM and on Monday, May 28th from 11AM-4PM. Callbacks may be requested at the directors' discretion and will take place at Bangs Community Center, Amherst on May 31st. Rehearsals will be in Hadley and/or Amherst, start in early September and are typically held on two weekdays from 7-9:30 and Sundays 5-9:00 (with snacks coordinated by rotating cast member volunteers and company dinner on Sundays) Rehearsals will be at the Academy daily in the evening during tech week just prior to opening night. Auditioners should be familiar with plot summary and descriptions of the show and characters/relevant music selection for the part they are auditioning. A great general resource is The Gilbert and Sullivan Archive here The 1961 D'Oyly Carte Opera recording is one the best and is available on line with dialog here (Act 1) and here (Act 2) Piano-Vocal scores will be placed on reserve at Jones Library in Amherst and Forbes Library in Northampton. There is also a Schirmer piano vocal score onscribd.com here. 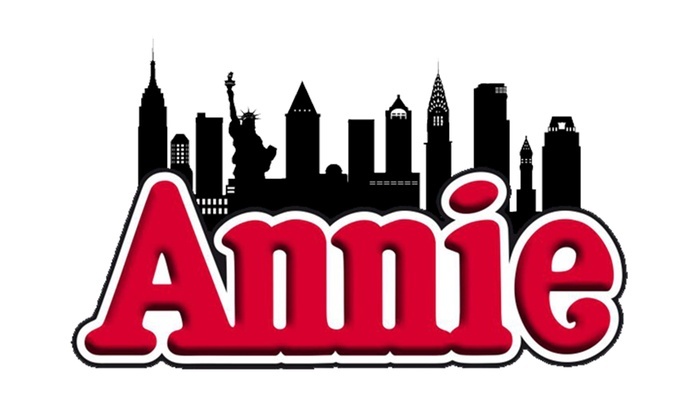 Character descriptions, vocal ranges, required audition vocal selections and readings (sides) may be accessed at the links provided below, and are also available on our web site at vlo.org. Note as of 5/13 we updated this link with an additional page that may be used for reading Duke, Luiz, Duchess and Casilda. Auditioners should prepare to sing one number from the Gilbert and Sullivan canon or music in the style of Gilbert and Sullivan or similar musical theater. (Please bring sheet music if not from The Gondoliers - Piano accompaniment will be provided.) Additionally, auditioners for principal roles should be prepared to sing the musical selection indicated for their character. Auditioners may also be asked to match pitch and/or demonstrate vocal range. Auditioners for lead roles should be prepared to read from the indicated dialog and are strongly encouraged to practice and work on their character interpretation prior to the audition. All auditioners should bring comfortable shoes as you will be asked to demonstrate your movement and dance capability. There will be opportunities in the cast for participants with varying levels of dance experience and expertise, as well as featured dance roles. Audition forms are accessible via the Google Drive link here. Valley Light Opera is committed to diversity and everyone is encouraged to audition and participate. We traditionally may cast some children in the ensemble. Age and gender are noted as played on stage - we may cast across age and gender as long as the actor can play the indicated age and remain true to the gender of the character and vocal range. We also have MANY roles behind the scenes. If you have a talent for theatre arts and sciences, or want to learn - we welcome volunteers at all levels for backstage, technical, costume, administration, publicity and assistants to the production team - whether or not you audition or are cast! Valley Light Opera is a primarily volunteer organization and is a not-for-profit based in Amherst, MA. Each year for over 40 years the VLO has produced fully-staged, orchestrated and lavishly costumed productions of Gilbert and Sullivan operettas and other large musical theater works. Rehearsals are typically in Hadley or Amherst, and performances at the Academy of Music in Northampton. Applicants who are unfamiliar with the VLO are encouraged to explore our website at vlo.org. (South Hadley, MA) Black Cat Theater is seeking letters of interest and resumes for the position of Stage Manager for their Fall musical The Wizard of Oz. Rehearsals begin in September and show dates will be in November. Email letter of interest and resume to blackcattheater@gmail.com by Saturday, June 2. West Springfield, MA (4/30/18) – Auditions for both Equity and non-Equity performers for roles in the upcoming 2018-2019 Season will be held at West Springfield’s Majestic Theater in June according to Producing Director Danny Eaton. This will be the 22th Season since the Majestic was re-opened for live theater in March 1997. Actors will be auditioned for parts in the following productions: “Johnny Guitar” (September 6 – October 21, 2018), “The War and Walt Whipple” (November 1 – December 9, 2018), “The Mountaintop” (January 3 – February 10, 2019), “Boeing-Boeing” (February 21 – March 31, 2019) and “The Marvelous Wonderettes” (April 11 – May 26, 2019). Equity auditions are scheduled in five minute time slots and participants must prepare a monologue. If auditioning for a musical, performers must bring sheet music of their choice. An accompanist will be present. Equity performers may be asked to stay longer, if time permits, and read from prepared script selections. Non-Equity auditions are scheduled in 10 minute time slots. Non-Equity performers new to the Majestic should prepare a monologue of their choice and, if singing, bring an instrumental CD accompaniment as well as a picture and resume. They will also be asked to read from prepared script selections. To book an audition, call the Majestic Theater at 413.747.7797. They will be held at the Florence Civic Center next to Lilly Library from 4:00-6:00. All ages and abilities are encouraged to join the fun. It’s a great opportunity for people who want to play and try out improv. The cost is $25 per family. Any questions, contact me at 413-584-5562 or email me at Heidi_Haas@comcast.net.